Chad Meredith Hurley (born January 24, 1977) is an American media mogul, co-founder and former CEO of the video-sharing website YouTube and MixBit. In June 2006, he was voted 28th on Business 2.0's "50 People Who Matter Now" list. In October 2006, he and Steve Chen sold YouTube for $1.65 billion to Google. Hurley worked in eBay's PayPal division—one of his tasks involved designing the original PayPal logo — before starting YouTube with fellow PayPal colleagues Steve Chen and Jawed Karim. Hurley was primarily responsible for the tagging and video-sharing aspects of YouTube. World Economic Forum Annual Meeting 2009, Davos, Switzerland. Hurley was born in Reading, Pennsylvania, the second child of Don and Joann Hurley, and grew up near Birdsboro, Pennsylvania. He has an older sister, Heather, and a younger brother, Brent. Since childhood, Hurley showed interest in the arts, and became interested in computers and electronic media during high school. He was a standout runner for Twin Valley High School's cross-country program, which won two of its PIAA State titles with him as a member in 1992 and 1994. He was also a member of the Technology Student Association during high school. He graduated from Twin Valley High School, Elverson in 1995 and went on to receive his B.A. in Fine Art from Indiana University of Pennsylvania in 1999. Hurley founded YouTube in 2005 with Steve Chen and Jawed Karim. On October 16, 2006, Chen and Hurley sold YouTube to Google Inc. for $1.65 billion. It was reported in the Wall Street Journal that Hurley's share was $345.6M at Google's February 7, 2007 closing stock price of $470.01. He received 694,087 Google shares directly and another 41,232 shares in a trust. YouTube's other two co-founders, Steve Chen and Jawed Karim, received 625,366 shares and 137,443 shares, respectively valued at $326.2M and $64.6M. The Journal's report was based on Google's registration statement with SEC filed on February 7, 2007. In August 2013, Hurley launched another company called MixBit which does video editing using smartphones. According to Steve Chen, it was Chad’s idea to turn Avos into MixBit even before the inception of YouTube. The App resembles other famous short-video recording smartphone apps such as; Vine, Instagram and Vyclone. Its limit of recording stretches up to 256 clips, each clip can be maximum 16 seconds long. It also features the editing tools similar to its other competitor apps. Mixbit now Zeen was acquired by BlueJeans in August 2018. Chad was involved as a major investor with US F1 Team, one of the new entrants in Formula One automobile racing for the 2010 season. On March 2, 2010, the team's personnel were dismissed from their duties and the team was unofficially shut down. Neither Hurley, team principal Ken Anderson nor sporting director Peter Windsor would comment on the team's failure to make it to the grid. Hurley has made several investments. He is a part-owner of the NBA's Golden State Warriors and the MLS' Los Angeles Football Club. ^ a b "YouTube Founders Launch New Video-Sharing App MixBit". PC Magazine. ^ "Google Has Acquired YouTube". techcrunch.com. Retrieved June 28, 2010. ^ "Web 2.0 Summit – November 7–9, 2006 – San Francisco, CA: Speaker". Web2con.com (archived copy). Archived from the original on March 9, 2011. Retrieved March 21, 2016. ^ Graham, Jefferson (November 21, 2005). "Video websites pop up, invite postings". USA Today. Gannett Co. Inc. Retrieved July 28, 2006. ^ Hammock, Rex (July 30, 2015). "YouTube Co-founder Chad Hurley's Advice to Small Business Owners". Retrieved July 4, 2018. ^ IUP News and Events – What They Said, Iup.edu, November 2008. ^ Cloud, John (25 December 2006). "The YouTube Gurus". Retrieved 22 September 2018 – via content.time.com. ^ Kerr, Ronny. "Chad Hurley isn't really YouTube CEO anymore". VatorNews. Retrieved November 11, 2010. ^ "YouTube Co-Founders Split As Hurley Spins Out MixBit And Chen Joins Google Ventures – TechCrunch". techcrunch.com. Retrieved 2018-04-24. ^ "YouTube founders remix Vine and Instagram with Mixbit for iOS". The Verge. Retrieved 2018-04-24. ^ Collier, Matt. "BlueJeans Makes Moves with MixBit". BlueJeans Blog. BlueJeans. Retrieved September 20, 2018. ^ "Team US F1 shuts down operation". Autosport.com. Retrieved November 16, 2010. ^ "LAFC - Los Angeles Football Club". Retrieved 15 October 2016. 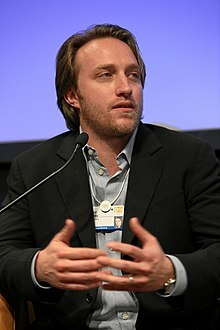 Wikimedia Commons has media related to Chad Hurley.